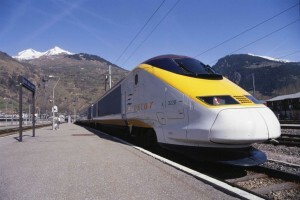 Ski Train tickets from London to the French and Swiss Alps for the 2012/13 ski season are on sale, as from 11 October 2012. The Ski Train routes are operated by Eurostar and Rail Europe, and the new winter schedule starts on 9 December. To get to the ski areas of the Swiss canton of Valais (including Zermatt, Verbier, Saas Fee, Gstaad, Crans-Montana and the resorts of Les Portes du Soleil), you simply travel by Eurostar to Lille then hop on the speedy French TGV train to the main stations along the Rhône valley (Aigle, Martigny, Visp and Brig) which link in with short hops on regional trains up to the various resorts. Ticket prices start from £189 return and operate from Saturday 22 December 2012 to Saturday 13 April 2013. Ski Train tickets to the Tarantaise region of the French Alps are also now on sale. The train travels via Paris to Moutiers, Aime and Bourg St Maurice station, from where it’s an easy hop on public transport to numerous resorts including Les Arcs, La Plagne, Tignes and Les 3 Vallees. Prices start from £109 return. Frustratingly, you can only buy tickets for the French destinations for a three month booking window (you can book from 11 October up to 11 January 2013). If you hope to travel after that date, you can’t book until November, and so on. For February half-term bookings, the golden date for booking is 16 November. Apart from the obvious environmental appeal, there are several advantages: there are no charges for carrying ski equipment; kids have more space to move around; and if you take the overnight train (not recommended for tinies but great for families with older children), you get an extra day on the slopes. We also find, in many ways, travelling by train makes your vacation last longer – the journey becomes a part of the holiday rather than a means to an end (as with flying) and you don’t have to hang around at crowded airports either. It would seem that more people are opting to travel by train to the Alps – the fast trains in mainland Europe combined with the efficient services of the Eurostar, French TGVs and Swiss railways provide swift and frequently more seamless transportation than flying. However you chose to travel – by plane, car or train – click HERE for some handy ideas on how to amuse the kids en route.